International art experts consider the Metropolitan Museum of Art in New York City to be one of the world's two greatest all-around art museums (the other being the Louvre). The Met attracts about 6 million visitors per year. Only the Louvre Museum is Paris draws more. The Metropolitan Museum's masterpieces cover a 5000-year span. Presentation is excellent - most artworks are positioned and lit skillfully to maximize viewer appreciation. As expected, the Metropolitan Museum houses the preeminent collection of American art. The celebrated artists include Eakins, Homer, Remington, Sargent and Tiffany. However, it's in European art that the Metropolitan Museum excels the most. 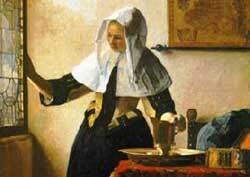 You can view an extensive number of European masterpieces including those by Botticelli, Breugel, Cezanne, Degas, Gauguin, El Greco, Manet, Monet, Rembrandt, Rubens, Van Gogh, Velazquez and Vermeer (see above picture for his "Young Woman with a Water Jug"). The Greek, Roman and Egyptian art collections in the Metropolitan Museum are also widely heralded, as are those on African, Chinese and Japanese art. Outstanding object-theme exhibits include arms & armor, costumes and musical instruments. You could easily spend several days exploring the vast and varied Metropolitan Museum. Click Metropolitan Museum of Art for its website.